Small town in Mittelfranken, containing one of the oldest Jewish communities in Bavaria. 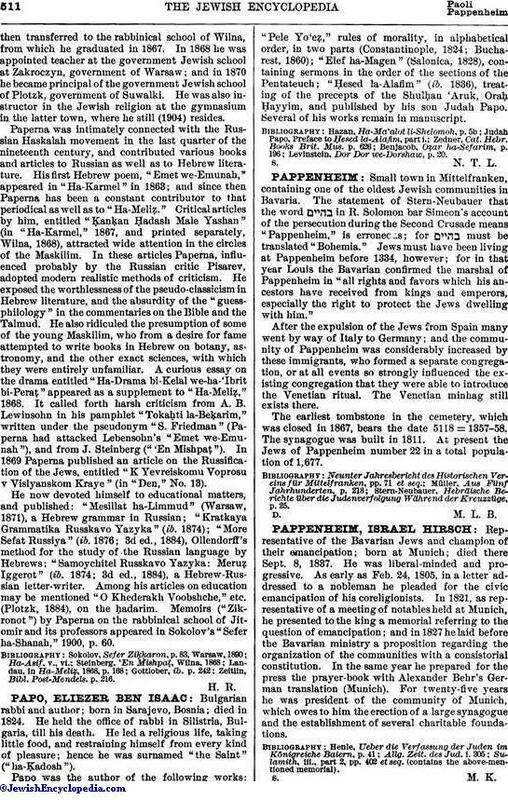 The statement of Stern-Neubauer that the word in R. Solomon bar Simeon's account of the persecution during the Second Crusade means "Pappenheim," is erroneous; for must be translated "Bohemia." Jews must have been living at Pappenheim before 1334, however; for in that year Louis the Bavarian confirmed the marshal of Pappenheim in "all rights and favors which his ancestors have received from kings and emperors, especially the right to protect the Jews dwelling with him." After the expulsion of the Jews from Spain many went by way of Italy to Germany; and the community of Pappenheim was considerably increased by these immigrants, who formed a separate congregation, or at all events so strongly influenced the existing congregation that they were able to introduce the Venetian ritual. The Venetian minhag still exists there. The earliest tombstone in the cemetery, which was closed in 1867, bears the date 5118 = 1357-58. The synagogue was built in 1811. At present the Jews of Pappenheim number 22 in a total population of 1,677. Stern-Neubauer, Hebräische Berichte über die Judenverfolgung Während der Kreuzzüge, p. 25.